Your credit report contains a record of almost all your credit and loan accounts, delinquent debts, and some public records. Since your credit report is the basis for many financial decisions, you want the most positive and accurate information to show on your credit report. You also want negative information gone as quickly as possible. While positive information may be reported indefinitely, negative information can only stay on your credit report for a certain length of time. This time period is known as the credit reporting time limit. 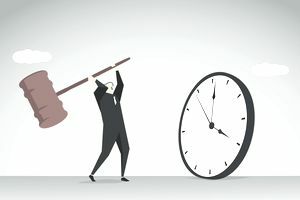 Many consumers erroneously think that debts should disappear from their credit reports after the statute of limitations has passed, but they're confusing the statute of limitations with the credit reporting time limit. Because of the difference in these two time periods, some debts can still be listed on your credit report after the statute of limitations has run out. The statute of limitations and the credit reporting time limit are two separate and independent time periods, governed by separate laws. The statute of limitations varies by state and can be as short as three years, depending on each state’s law. The statute of limitations affects the amount of time that debt is legally enforceable. In other words, it’s the amount of time a creditor can use the court to force you to pay a debt. In most cases, the statute of limitations has no bearing on whether a debt shows up on your credit report and only impacts a creditor's ability to win a lawsuit against you. To win a case based on the expiration of the statute of limitations, you (and your attorney) have to show up to court and present the argument along with proof that the statute of limitations has passed. The credit reporting time limit, on the other hand, is the time period that defines how long a negative debt can be listed on your credit report. The period as defined in the Fair Credit Reporting Act (FCRA) is seven years for most debts. The FCRA is a federal law and is the same for all debts, regardless of the state where the debt was created. Once the credit reporting time limit has passed, most negative information will automatically fall off your credit report with no effort on your part. If there’s outdated negative information on your credit report, you can submit a credit report dispute with the credit bureau to have it removed. If you live in one of those states with a shorter statute of limitations, you may have debts that remain on your credit report even after the statute of limitations has passed. The exception is when a state’s statute of limitations for a lawsuit judgment is more than seven years. In that case, the judgment may remain on your credit report until the statute of limitations has elapsed. If you restart the statute of limitations—by making a payment on the debt, for example—it does not increase the amount of time the debt will show up on your credit report. It’s typically best to pay off past-due accounts that still have several years to show up on your credit report, regardless of whether the statute of limitations has passed. Creditors and lenders will view you more favorably once the accounts are paid off.